Meal Planning is a wonderful thing. If you have already read my article on Meal Planning 101 – you already know many of the benefits of meal planning. Now let’s explore some tools that will make the process as easy as possible. 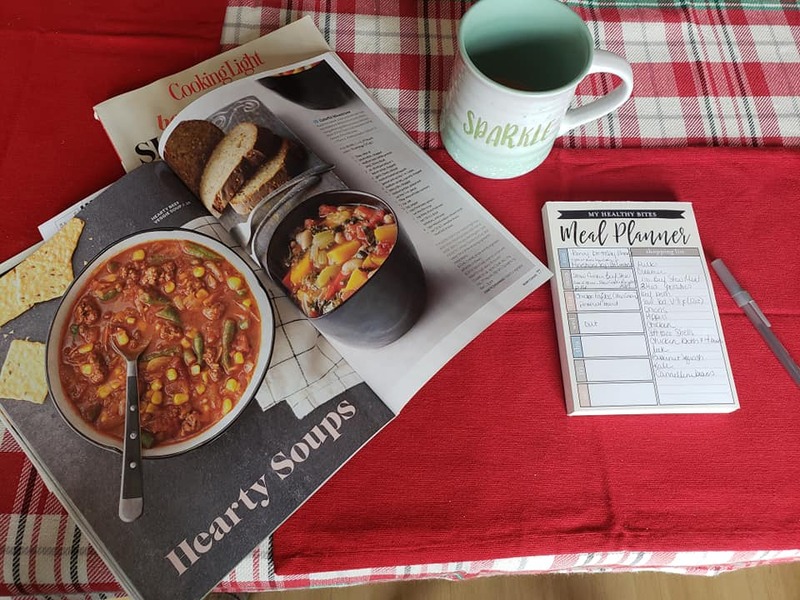 I have found these tools over the years meal planning – and they just make my life easier – so I’m sharing! 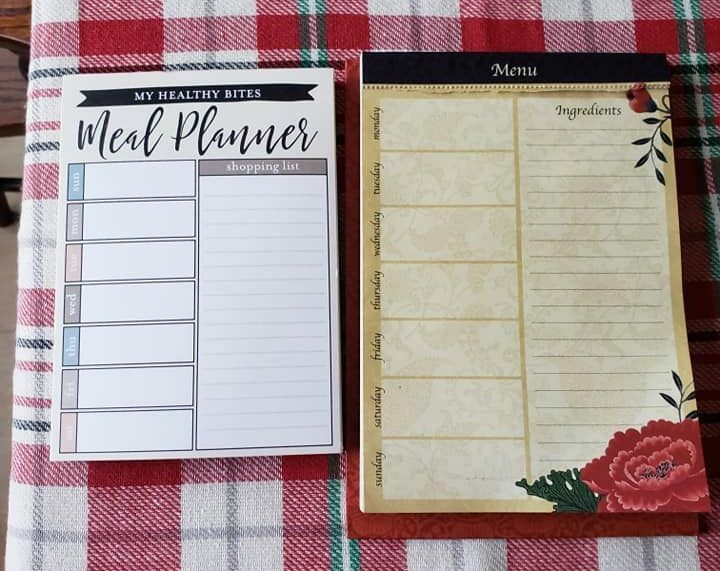 I realize some of you enjoy using more written methods of meal planning, and some of you are probably more technology driven and prefer techy ways of meal planning. I will include ideas for both. 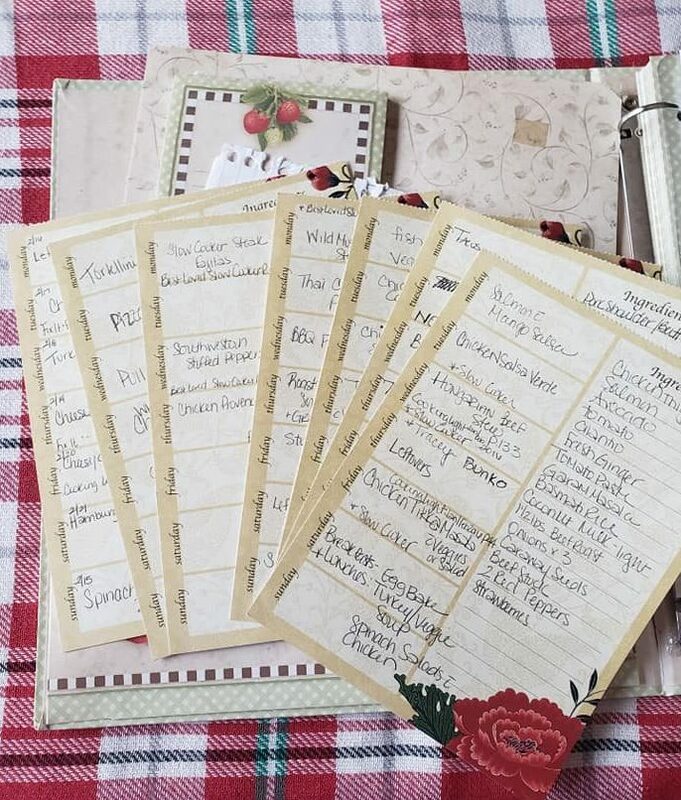 Having a specified pad to write down meals – and create a grocery list as you go is really helpful! Originally when I started – I didn’t have a pad that had the grocery list – so I would create one on a separate sheet of paper (or in my phone). Later I found these pads that have the grocery list – and I just prefer not to have to grab a different pad to write down the things I have to pick up at the store. (The pad on the left I created on Shutterfly, the one on the right I found at The Christmas Tree Shop). I will admit, I snap a pic of my grocery list on my phone, or enter the grocery list on in a grocery app – as I seem to always lose my piece of paper list! The app I use is called Out of Milk. *Some people prefer using a white board to write out the meal plan. While this works for others in the house hold to see it – I don’t love this method – stay tuned for more on this. *Techy: Yes, there is an app for that (or hundreds). There are many meal planning apps out there that will help you choose meals of your liking, and even create your grocery list at the same time (like the app mealime). Apps have their benefits – they are available on your phone at all times; they may be quicker as they present you with recipes that meet the needs/wants you told the program about; the grocery list is right at your fingertips on the app. They also have their drawbacks: you may not be able to share the meal-plan or grocery list with someone else in the family who is willing to cook/shop; no one else can see it so you might still get the dreaded questions “what’s for dinner” several times. *Which ever method you choose to use – make sure it works for you! Yeah this one seems pretty obvious – but you do have to have them to meal plan (even the ones that are in your head). 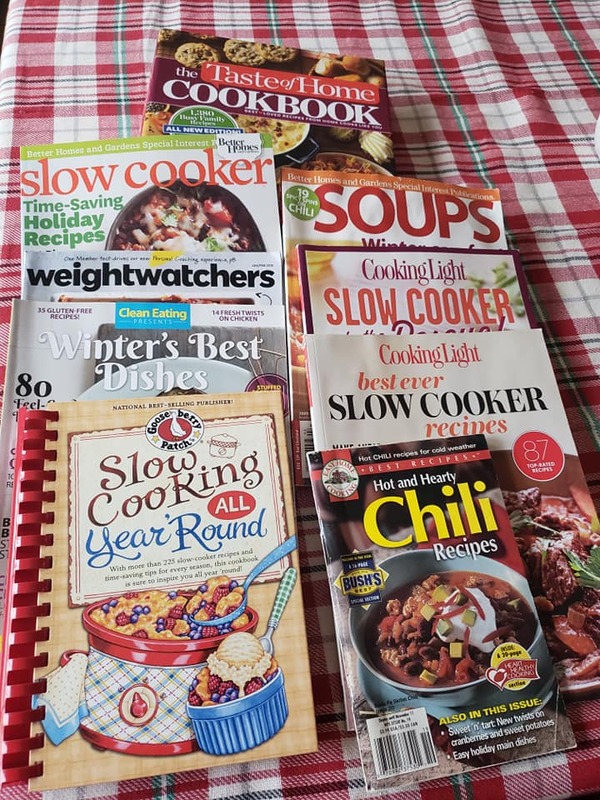 *There are many, many recipe sites – make sure wherever you get recipes from, there is a way to save them – or print them out. 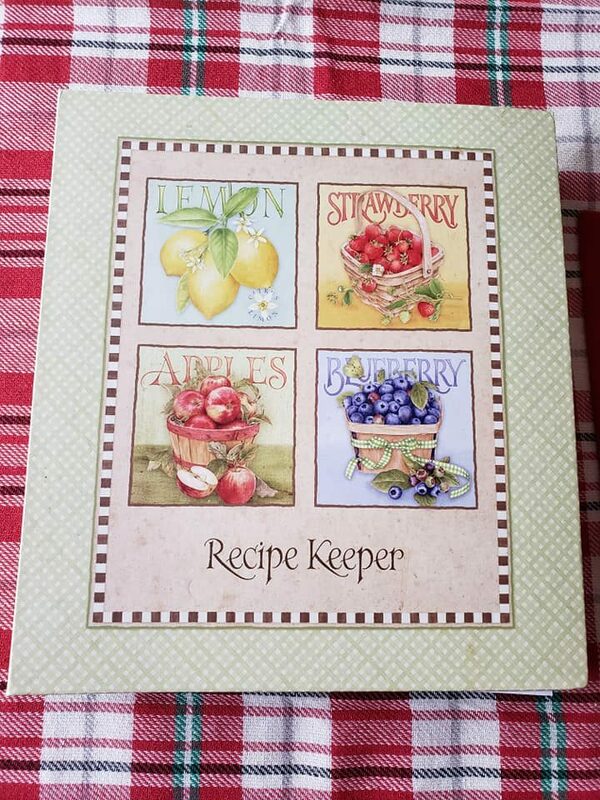 A binder – or on a techy device it might be saved for you – like pinning to a board that you made – or some sites will create a recipe box of your saved recipes – such as Yummly. *Time Saving Tip: I like to save my meal plans (with the attached grocery list). That way when I have a busy weekend, and minimal time to plan – I can just recycle a weekly meal plan that I already made. This is why I don’t love using a white board (because all that great work and planning just gets erased). You could probably plan on paper, then transfer to a whiteboard if you really want to use one. *That’s It! It doesn’t take a lot of tools to meal plan – but having the right tools does make it easier and more fun! Happy Planning! 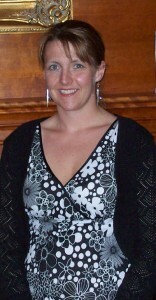 My Healthy Bites Nutrition Services, PLLC.